It continues to be windy and cold in Kalamazoo. The birds have both been hunkered down over the eggs, keeping them warm. Even Kewpee, who usually acts like he has ants in his pants, has incubated for long shifts. 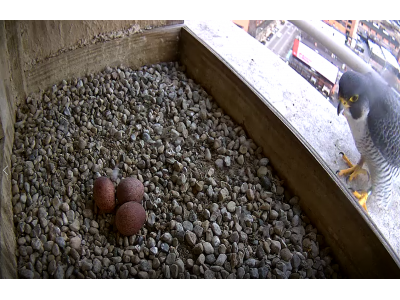 We saw the third egg this afternoon when Kewpee stood up to stretch around 2:30, but don’t know when it was laid. He and Rebecca switched back and forth for a couple hours in the afternoon before Rebecca settled down for the early evening shift.